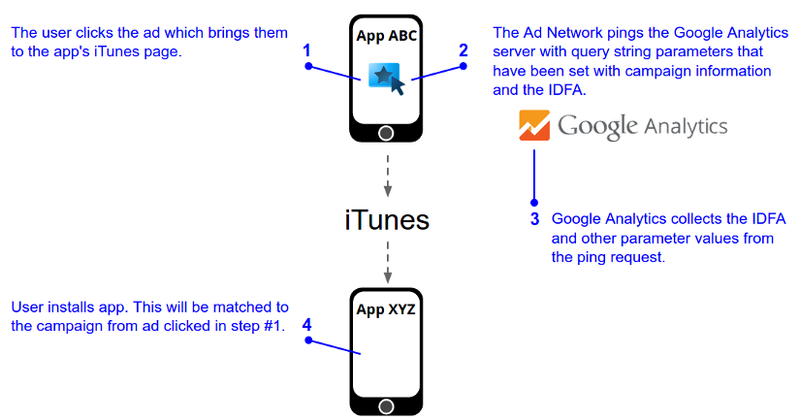 iOS install tracking allows Ad Networks to offer app marketers a way to find the source of installs on the Apple iOS platform, when using Google Analytics. Typically an app developer uses an Ad Network (or multiple Ad Networks) to set up an App download campaign. 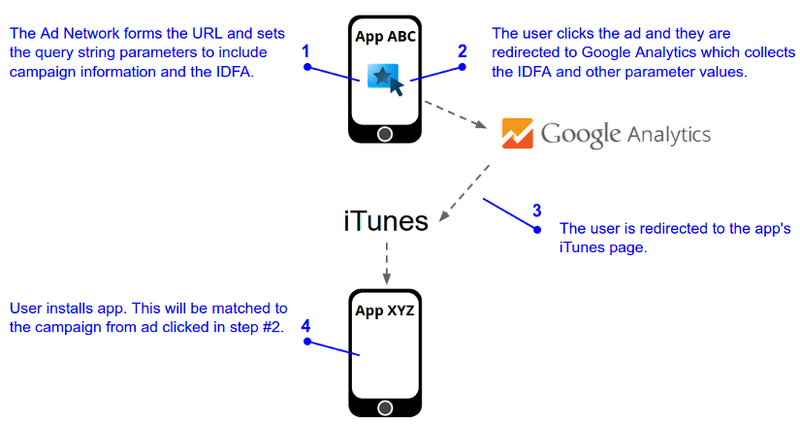 For install tracking on iOS, Google Analytics relies on Apple's resettable Identifier for Advertising (IDFA) to match app sessions to campaigns. To accomplish this, Google Analytics relies on Ad Networks to provide and send the IDFA and other campaign information to Google Analytics when an app user clicks on an ad. The Ad Network forms the URL and sets the query string parameters to include campaign information and the IDFA. The user clicks the ad and they are redirected to Google Analytics which collects the IDFA and other parameter values. The user is redirected to the app's iTunes page. If the user installs the app it will be matched to the campaign from the ad clicked in step #2. Note: Google Analytics needs to be implemented on the app that the user installs. Figure 1: The redirect flow for iOS install tracking. tid=UA-1234-1                                                 // Google Analytics Tracking ID. &url=https%3A//itunes.apple.com/us/app/myApp/id123%3Fmt%3D8   // Redirect URL to iTunes. See the Measurement Protocol parameter reference for details on campaign and app tracking parameters. The user clicks the ad which brings them to the app's iTunes page. The Ad Network pings the Google Analytics server with query string parameters that have been set with campaign information and the IDFA. Google Analytics collects the IDFA and other parameter values from the ping request. If the user installs the app it will be matched to the campaign from the ad clicked in step #1. Figure 2: The asynchronous ping flow for iOS install tracking. iOS install campaign measurement — an overview of how to measure campaigns and traffic sources with the Google Analytics SDK for iOS v3. Troubleshooting iOS install campaign measurement — steps to troubleshoot if you don't see conversions for your iOS install campaigns. iOS Campaign Tracking URL Builder — a tool to generate URLs for measuring the source of iOS application installs. If you support either the Redirect or Asynchronous ping method you may be eligible to join the Google mobile conversion (GMC) provider program. Last updated January 15, 2016.